Valentines Day will soon be upon us. That could either be good or bad, depending on your relationship status. Although I can’t do anything about your relationship status, I can ensure you have something sweet to enjoy. That’s where my Homemade Ice Cream (Without Eggs) comes in. 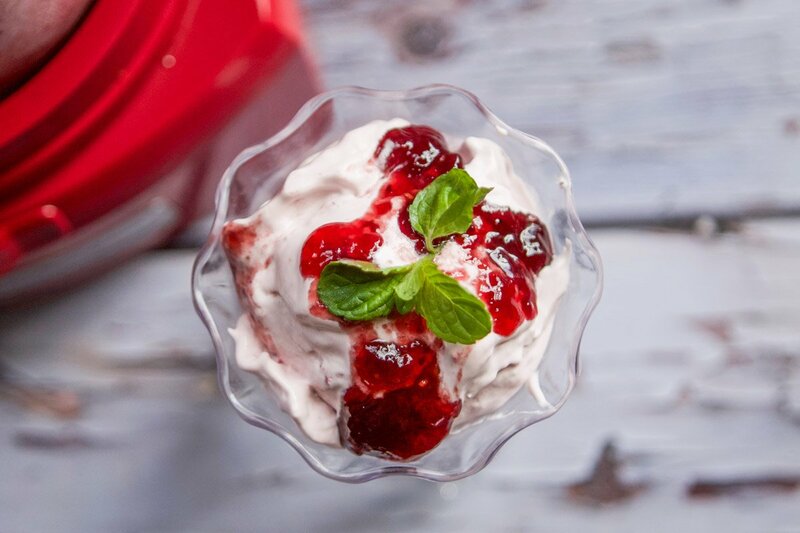 Think of it as a mix of cheesecake, ice cream, raspberry preserves, and a blend of fresh raspberries. Just because we’re trying to eat healthier, doesn’t mean we have to deprive ourselves either. It’s all about moderation, which is why a serving size is only half of a cup. So, come on, don’t you want to snuggle up with a bowl of my Homemade Ice Cream (Without Eggs) this Valentine’s Day? 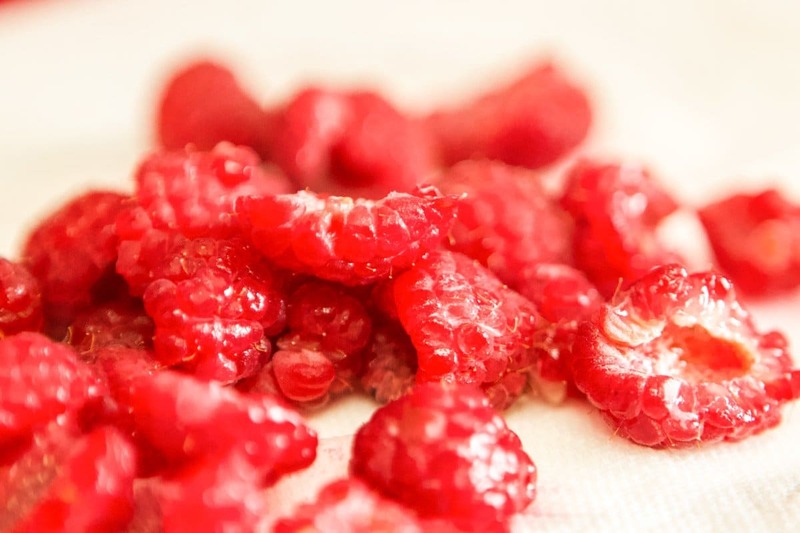 Raspberries are one of my daughter’s favorite fruit. So when she asked me to make her some “fruity” ice cream, I knew I had to include them. I also knew she wanted it NOW, so I didn’t want to mess with making an egg-based/custard ice cream. Nena loves cheesecake, so I decided to incorporate some cream cheese into the recipe. To kick up the sweetness, I included some raspberry preserves that was taking up shelf space in my over-filled fridge. Don’t get me wrong, I’m not complaining about my over-flowing fridge. I regularly thank the Lord for his overwhelming blessings. Sometimes it just feels good to clear out the fridge! 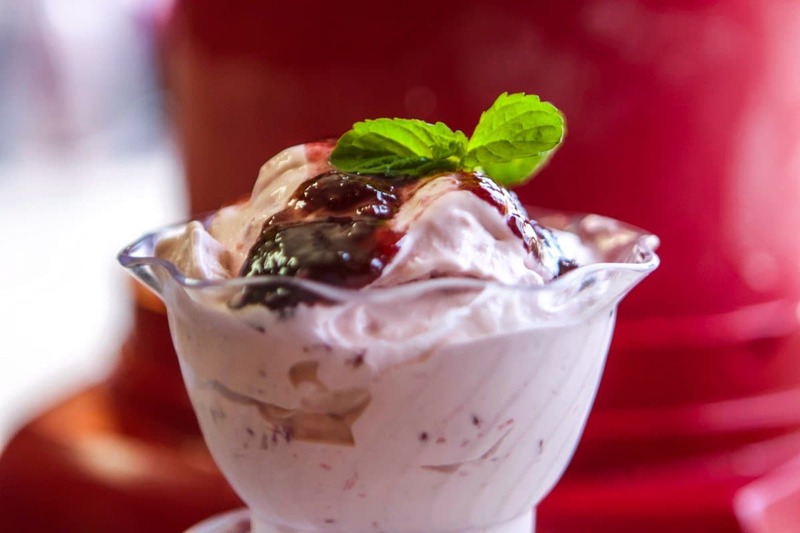 By taking a basic vanilla ice cream recipe, and adding these mix-ins, I was able to create this delicious cheesecake-flavored ice cream recipe for my daughter. 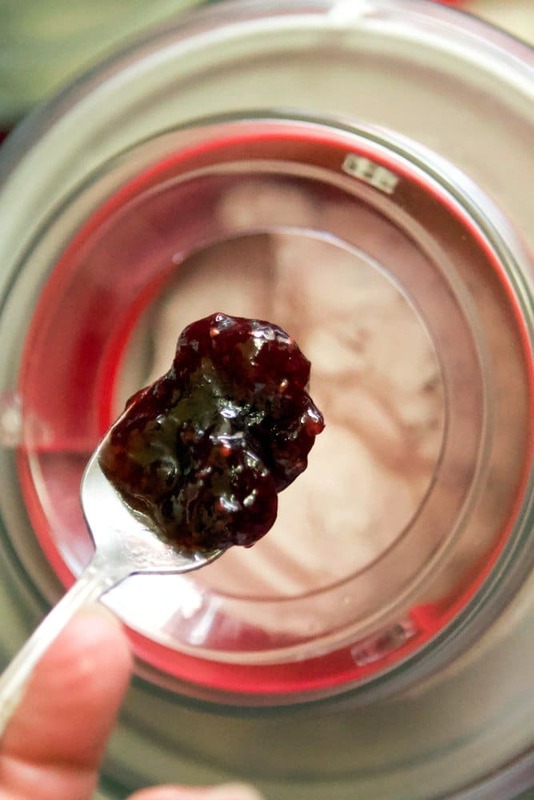 Consider adding other fruit preserves based on your own preference! Did you know that you don’t need eggs to make ice cream? I don’t know about you, but I always assumed that eggs were a required ingredient in ice cream making. It’s true, they do add a richness that’s hard to duplicate. 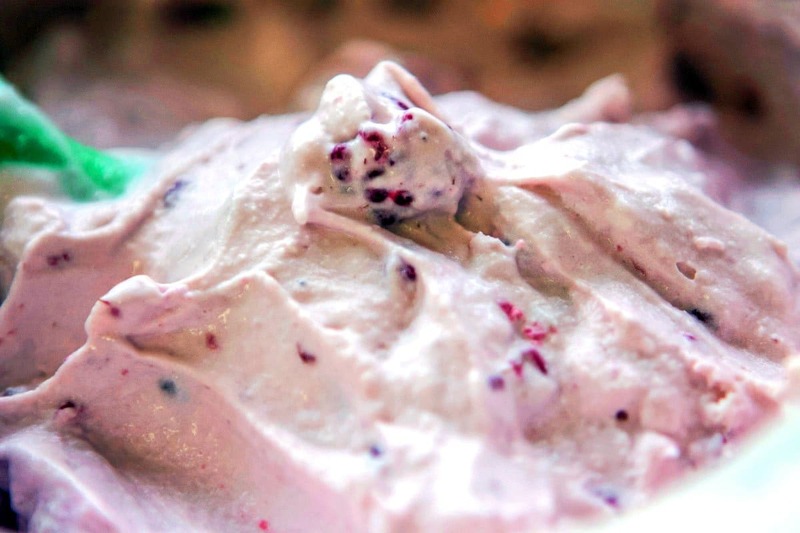 However, if you are looking for an egg-free ice cream recipe, you’ve found it! You’ll never even miss the eggs with this decadent Homemade Ice Cream (Without Eggs) recipe. So grab your ice cream maker and follow me! 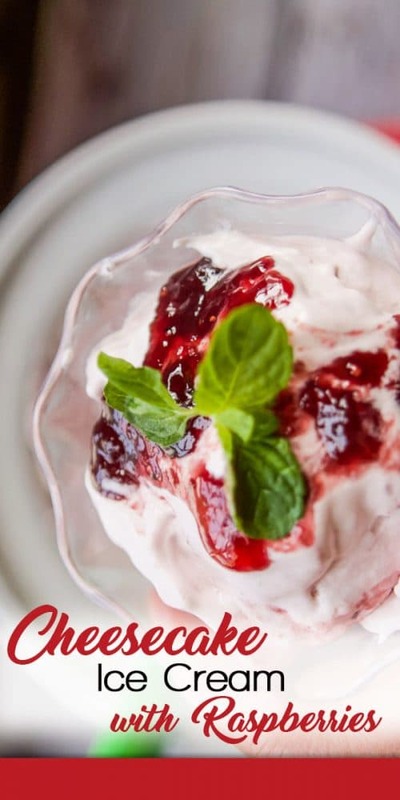 By now you should be familiar with this phrase: “use this ice cream recipe as a starting point, but experiment mixing in some of your favorite ingredients.” The easiest way to change the flavor is to add other fresh fruit or preserves, like plum preserves, strawberry, or even fig! Or consider drizzling in some melted white or dark chocolate. If you are a nut-lover like I am, add some chopped pistachios or walnuts. But my absolute favorite ice cream mix-in or topping has to be toffee. So, how about you, what’s your favorite ice cream mix-in? I’ve been planning the perfect Valentine’s meal for the last month. Not only for my dear husband but for my readers too! This delicious meal will consist of Seared Lamb Loin Chops, with a Cherry Reduction Sauce, sweet kale salad, and a side of Low Carb Jalapeno Poppers. This satisfying meal will be followed by an easy to prepare Chocolate Mug Cake, with hints of coffee and cardamom. The mug cake can be served as is, but I recommend serving it topped with this Homemade Ice Cream Without Eggs. 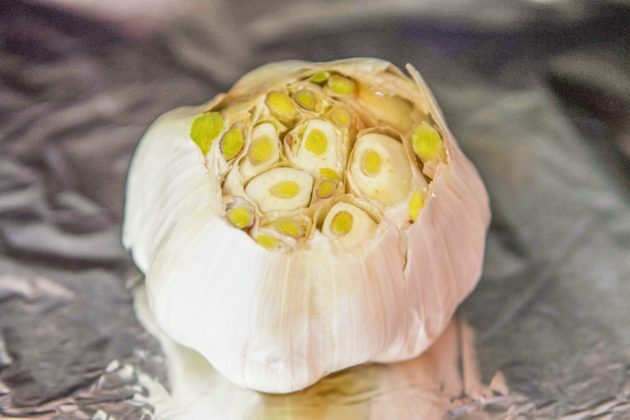 It will definitely take it to a whole new level! If you choose to serve this ice cream on its own, think about topping it with extra preserves, nuts, or a drizzle of caramel or chocolate sauce. It’s Valentine’s Day, so live a little! If you love cheesecake like my family does, be sure to check out my Kahlua Coffee Cheesecake Recipe. 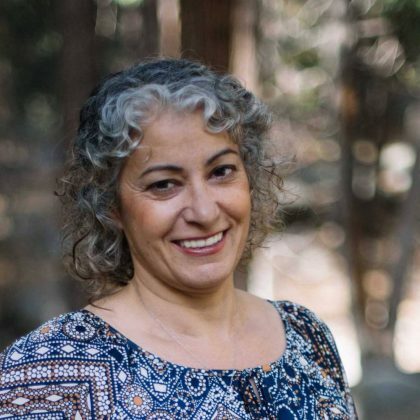 If you’re in the mood for something else or don’t own an ice cream maker, you might want to check out my friend Katherine’s recipe for Persian Love Pop Tarts! 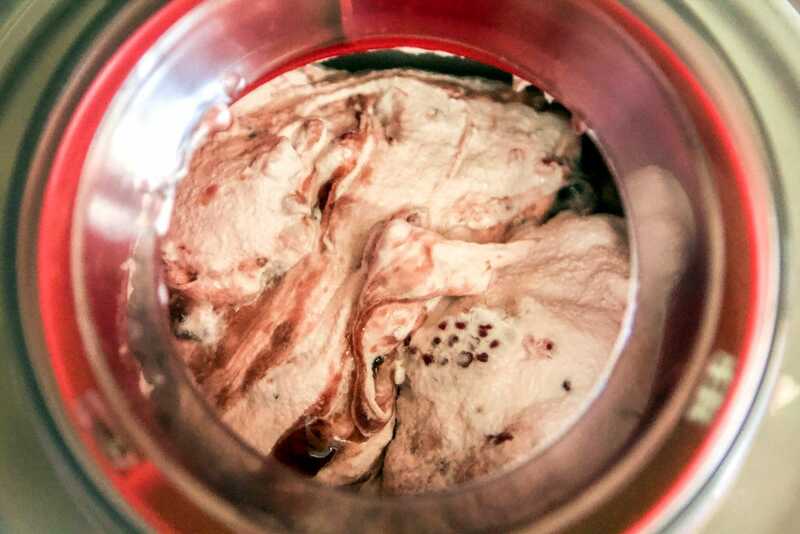 Cheesecake Ice Cream, with a raspberry swirl, made in your own kitchen! Blend all the ingredients, except the last two, until smooth. Place frozen ice cream bowl in your ice cream maker, add churning attachment. Turn on the ice-cream maker and slowly add the blended ingredients. After ten minutes, add the fresh raspberries. After five additional minutes, add the preserves one tablespoon at a time, and churn for five additional minutes. You might have to help the preserves mix in by pushing down with a spoon. If you prefer the ice-cream firmer, transfer the ice-cream to a lidded container and freeze for a few hours, or until the desired results are achieved.